Northumberland is a region of dramatic locations from Hadrians Wall to enchanting castles, gardens and miles of heritage coastline. Sunday  After joining the coach from your taxis we head north to Gateshead and our hotel for the next 4 nights. Comfort stops on-route. Monday  Today we visit Beamish The Living Museum of the North. This multi award-winning museum is unique, objects arent locked away in glass cases, this is really hands-on history. Explore the 350-acre site and meet friendly costumed folk wholl share stories with you. Ride a steam train, take a tram ride or even go underground at a real coal mine, history comes to life at Beamish. You will have the whole day to experience the sights, sounds, smells and tastes of the past at your own pace. These attractions are all included in your entry ticket. Tuesday  Today we travel the short distance to the university city of Newcastle upon Tyne. A major shipbuilding and manufacturing hub during the Industrial Revolution and now a centre of business, arts and sciences. We will enjoy a step-on guided tour before free time for lunch. This afternoon we will visit Chesters Roman Fort and museum, at Hexham the most complete Roman cavalry fort in Britain, along Hadrians Wall. Wednesday  This morning we make a morning visit to the historic market town of Morpeth. Today is also Market Day! 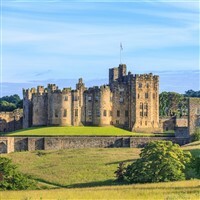 This afternoon we visit Alnwick castle and gardens, the stately home of the Duke of Northumberland, built following the Norman Conquest which has been renovated and remodelled over the years. You will have the whole afternoon to enjoy the castle and gardens which you may recognise as the location used in the Harry Potter films! Thursday  We say goodbye to Northumberland and begin our journey back to Wiltshire after a memorable holiday in Northumberland. Comfort stops on-route, returning early evening. A contemporary hotel nestled in the area of Gateshead quayside close to the Gateshead millennium bridge. Bright and modern en-suite bedrooms with hospitality trays, TV, telephone, hairdryer and free high-speed WiFi.